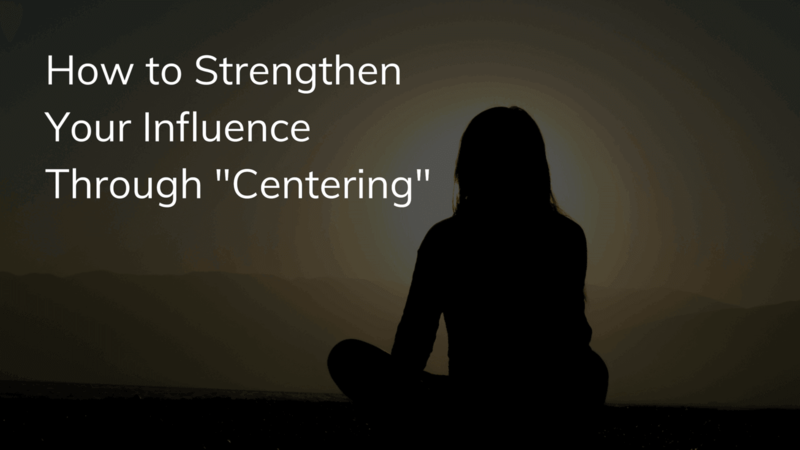 How to Strengthen Your Influence Through "Centering"
In the book, The Leadership Dojo, by Richard Strozzi-Heckler, leadership presence is five things: 1. Centering 2. Facing 3. Entering 4. Blending 5. Extending. These five things are all in existence all at the same time. In the book, Richard writes what is centering? Each one of these are a commitment. Centering is an embodied commitment to self-knowing. Center is this way of being such that what you are doing at all times is a finding out of what you are made of. It’s an attention to what you care about. It’s what I’m doing at all times is finding out what I’m made of. It’s a commitment to finding out “is what I’m up to really what I’m up to?” and “am I really showing up that way? In the book, one of the great Aikido master’s students asked him “what’s amazing about you is that you are always centered!” And the Aikido master said, “NO my child no, I am not always centered, but what I have the ability to do, is when I’m off-centered is to come back to it very quickly.” The only way you can “come back to center, is to know where you’re coming back to. You have to know where that place is and have that place as a nice home. Personally, I do this through meditation and through breathing. A lot of people stop breathing when things get crazy, it’s like “just breathe” and you can come back to center. Leadership presence is required to have others commit to you. What is leadership? Leadership is declaring a vision other emotionally commit to. So, how do people commit to you? They commit to you because you are the embodiment of your “WHY.” So you walk in the door and you are your why. You’ve kind of left your thoughts of “what do people think about me?” behind, your ego is gone. Leadership presence is about connecting deeply with others and the connection is what you stand for with what others care about. When you look at leadership, it’s this connection of passion, this connection of care. It’s being in the presence of someone who is taking a stand. How you do that is you are always connected to that big WHY and you own it, you embody it at all times. The formula for purpose (Richard leider) is purpose= gifts+ passions + values. Purpose is a verb, and your purpose is usually about others. It’s about creating a difference in the lives of others. Leadership is an embodiment of your purpose and centering is about being that purpose with others. People if they could live their live over again, they say: they wish they could have been more reflective, they wish they would have taken more risks and they would want their lives to matter. Or that they would have taken more risks so their lives would matter or that they would have made a bigger difference in the world. They wish they could have discovered their purpose earlier in life. I think for a lot of us, a lot of us haven’t even thought about what our purpose is anyways. But I do think that as we go through life we’re thinking “what am I here to do? Leadership presence is about centering and connecting to your center which is connecting to what you care about, and most of us have no idea what we care about. So, it’s very easy to be off-center. A lot of clients or your staff will come to you and say “I just need to manage my time, what’s the tool of the day” and the answer is always not the tool of the day, the answer is “what do you care about, what do you really, really care about and what are you here to do then focus on that, and then your answers will come. In this world where we have to “do, do, do” versus we don’t have to “be” we get knocked off-center. Your way of being is your “I am. Our way of being is the foundation for building trust, intimacy and connection. So, if you’re being that you will have the trust, you will have the intimacy and you will have the connection with others that you need.